I wrote a short while ago about the FA and its inability to do anything other than waste money pandering to the corrupt whims of Fifa and allow its name to go forwards into a world cup run in a state based on slave labour. My overarching claim that the media does not call the FA to task was taken up by a number of readers, pointing out the good work done by the Guardian and others in holding the Association to account. I do accept that, but my point was that when the FA comes out with mindbogglingly stupid excuses, or is guilty of crass ignorance, for example in relation to its reduction in funding from Sport England by blaming the weather last October, when actually things weren’t too bad, the media just let it pass. At the risk of appearing to be fixated on the issue, I’d like to take a specific point. It is local, it relates to an area that you might not have heard of, but it is typical of what is going on. In this case, it is not the FA per se that is at fault directly – it is the local council – but it is the FA that is not funding local football properly and which allows local councils in England (themselves under pressure having had their funding reduced dramatically by a central government intent on tax cuts) to get away with cutting football facilities. I know (because Untold originally broke the story about five years ago) that the reason that the England team does so badly is the poverty of coaches in the country, but even if we had all the coaches we needed, it wouldn’t do any good if ultimately we run out of places to play football. The example of the way things are going relates to Old Parkonians , one of north-east London’s main sporting organisations that runs 10 football teams and 15 cricket teams serving all ages. The club is based as Oakfield which provides first class facilities for football and cricket plus a clubhouse offering a bar and catering facilities. and is a hub for social interaction. As well as Old Parkonians themselves, the ground is used by 14 other football teams and 2 further cricket teams. Late last year, Redbridge Council released plans to build on the Oakfield site which will mean Old Parkonians will be left homeless and a restful area of green will be erased from the landscape. OK, we desperately need houses, and in the UK have for about 30 years only been building half the number of houses we need – so I am not arguing about building houses. Indeed a relocation budget was provided but somehow the powers that be, while managing to relocate 5-team Frenford Football Club next door, also managed to overlook the 25-team Parkonians club and its grounds so no budget remains. It is a typical council move – and the FA stands by and watches and does nothing at all. Apart from spend £20m + on bidding for a world cup from a totally corrupt Fifa. If any of this means anything to you, you might care to support this club in its bid to fight the plans by signing an e-petition. It is not an Arsenal matter at all, of course, but as I’ve always insisted on declaring, this site is about football from an Arsenal perspective – and that means considering football at all levels. Do you fancy writing for Untold? Here are the guidelines. Thanks for this…I live up the road from the site. And I spoke to the local cricket and sports club, FRENFORD, who manage the site to and they seem to have given up and have thrown the towel in. That was last summer. But this pettition is a ray of hope. As one who played quite a few games there, (always a happy club to visit and they kept their beer well!) I’m more than pleased to add my name to the petition. Fit and proper loose cannon tells it like it is. He let’s several cats out of several bags. This is not safe for work, by the way! Cut our budget by £1.6m? We’ll get that back. They probably only have to sell 30,000+ shirts to make up that funding shortfall. Of course, The FA says that it has no input as to how much these shirts are priced at. If such theories are relevant in producing more talented footballers thus more experienced coaches, then Africa should be next powerhouse of football. It is a vast land. Just the thought of playing football with lions and hyenas as spectators really shrinks my balls. Hahaha. No subs then I think. Football is beauty ,fun and passion .Lest we forget that it is to be enjoyed and our youth encouraged to follow their dreams . M.Keown wrote in his report for his report to the FA early in the season on facilities. Also that was when we first heard the figures on the cuts and the declining numbers of people playing in England for this year, which only further highlight the recent comments on that issue. City are building some kind of a what they call Moon Slide, which will stick out of one side of that stadium they were gifted. Well. I thought that it was a funny April Fools joke from City, a good spoof of their own work and intentions. Certainly funnier then the Groaning AAA troll(s). The idea of the slide is not too far from the mega Goldolphin (Hehe! Neigh I could not resist…) inspired complex that they are actually planning. Great link to the Panyee FC, I admire their spirit & enterprise and positive get up & go attitude. 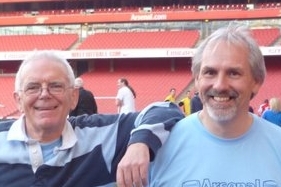 @ bjtgooner – After organised football as we know it is destroyed by greed ,apathy and corruption ,we will again get kids of all ages playing the game just for the sheer pleasure and thrill of it .